Vintage Style Cast Iron Heavy RCA Nipper Dog Dime Coin Bank 6 Inches and 3 pounds !! 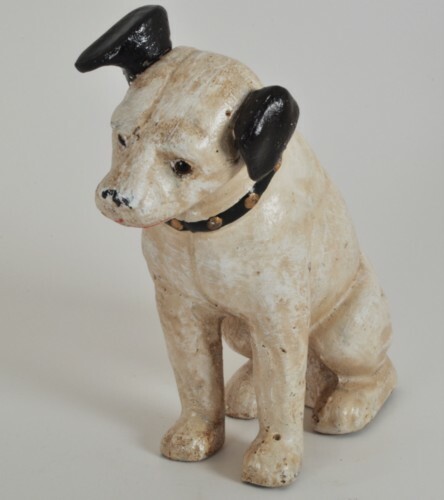 Here is a great cast iron Nipper Dog Coin Bank in Great Condition. Nicely painted this one is quite heavy for it's size at almost a full 3 pounds! (2 pounds & 15 ounces) He actually has tiny glass eyes!! Dimensions: Nipper stands approximately 6 inches tall and 5½ inches long from nose end to tail end. Perfect for the collector's accessory or for your home or office decor. Quite handsome and heavy for it's size! many as you wish for the same no cost to you shipping!! Get one for yourself and order more for special gifts!! We pay the shipping costs on this item! No charge to you for delivery!! IMPORTANT SHIPPING NOTE: Your Package will Ship USPS Priority Mail for faster delivery to you......with NO CHARGES!
. We do not try and profit from any shipping costs. Our shipping costs include Tracking Number and Information so you may track your purchase. Thank You for Shopping with Andtiques.com! !